Destruction of the British cavalry brigade at Maubeuge on August 23, 1914. 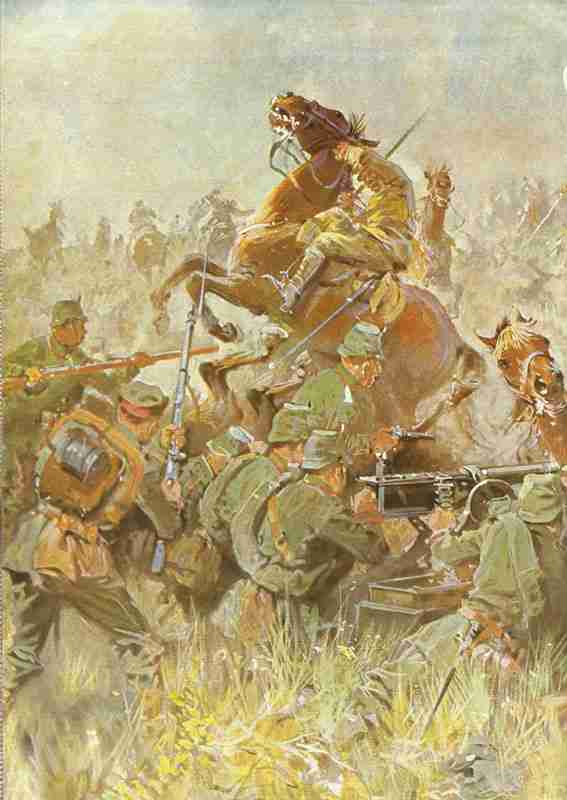 Not only breaks a cavalry charge in the fire of the machine guns, any attack of the old style will fail. All armies had still to learn the new way of warfare. Belgium – Battle of Mons: At Mons, in the final of the encounter of the Battle of the Frontiers, the British Expeditionary Force meets General Alexander von Kluck‘s German First Army. Although heavily outnumbered the British II Corps (36,000 men and 152 guns) repulse the first German attack, inflicting severe casualties with accurate and high-volume rifle fire. Subsequent Ger­man attacks force the British back just three miles. The British suffer 1,638 casualties and 2 guns to 4,000 Germans. Because of the withdrawal of Lanrezac’s French Fifth Army a little to the east, the British are forced to conduct an orderly retreat. Mons marks the end of the Battle of the Frontiers. Germans enter Namur, where 25 civilians were shot on August 25. To Helmuth von Moltke, the German chief-of-staff, this sprawling series of battles seems to herald a great victory. French casual­ties are high (some 300,000 men), and both they and the British are in seemingly disorganized retreat. On this basis he modifies the Schlief­fen Plan further. He orders his forces in northeastern France to continue their wide sweep aimed toward Paris but sends the reinforcements earmarked for them elsewhere – Lorraine – for a new attack. Two corps from the German right wing are also sent to the Eastern Front, where the Russian mobilization has been more rapid than expected. Other German units from the key right wing are to lay siege to Antwerp, where much of the Belgian Army is holding out, and to besiege the French-held fortress-city of Mauberge. Moltke’s evaluation of the strategic situation is false, partly due to his poor communications with his army commanders. In contrast, the French commander-in-chief, General Joseph that, although his casualties are heavy, the morale of his forces remains high. Joffre, by now aware of the location of the German armies, prepares a counterattack in northeast France. His forces in contact with the Germans are ordered to continue their orderly withdrawal, while armies around Verdun are to remain in position to act as an anchor for the offensive. Two new armies, the Sixth commanded by General Michel Maunoury, and General Ferdinand Foch’s Ninth Army, are created. Joffre plans to place the Sixth Army to the west of the far right wing of the German forces marching through northeastern France, and the Ninth is moved to bolster the line confronting the German forces advancing a little way to the northeast of Paris. However, the plan is thwarted for the moment by the speed of the German advance, which continues to force the French and British southward. Lorraine: French First Army resumes offensive, driving the Germans northeast until stopped on August 28. Japan: The government declares war on Germany and two days later opens hostilities with Austria-Hungary. The Japanese refuse to become involved in the war in Europe and concentrate their efforts against the German colony-port of Tsingtao in China. Germany: The government tries vainly through US Berlin Ambassador to get Allies to recognize African colonies’ neutrality (Berlin Act from 1885). East Prussia: Hindenburg and Ludendorff arrive at Mari­enburg, then Tannenberg. Rennenkampf renews advance but west on Konigsberg, his 1 st Cavalry Division takes Angerburg at north end of Masurian Lakes. Poland: First Battle of Krasnik (until August 25) southwest of Lublin: Austrian First Army against Russian Fourth, latter driven back 3 miles until next day. Galicia: Austrian Fourth Army at last massed. 1 st Kuban Cossacks charge and take Chertkov rail station and 4 Austrian guns of 1st Cavalry Division during crossing river Sereth. Serbia: Austrian IV Corps counter­attacks to cover retreat over Sava. Western Front: German troops by mistake shoot down Zeppelin L8 at Badonviliers. Belgium: Field Marshal von Goltz made Gouverneur-General with Sandt as Civil Administrator. General Hausen’s Saxons massacre 612 Dinant civilians and pillage town; 4,000 flee from Vise into Holland from German shootings (700 deported to Germany for harvest labour until August 24).